3.What is the reference of 18-Digits of UDIN? 8. From 1st February 2019 UDIN is mandatory for all the certificates? What is meant by Certificates? A drop down illustrative list as below is appearing on the Portal from which the Member can select the certificate they are going to issue. In case their certificates are not matching with the list provided, Members are advised to select others and mention the nomenclature of the certificate in Document Description. 16. Certificates in form 15CB. 17. Certificates in relation to initial Public Issue/compliances under ICDR and LODR. 20. Certification for claim of refund other Indirect Taxes. 22. Certification of arms length price u/s 92 of the Income Tax Act, 1961. 25. Certification of Fair Values of Shares of Company for transfer of shares from resident to non-resident. 28. Certification under the Income-Tax Laws for various Deductions etc. 9.What will not be covered under Certificates for UDIN which is being made mandatory w.e.f. 1st February 2019? (x) Any report of what so ever nature issued including Transfer Price Study Report, Viability Study Report, Diligence Report, Due Diligence Report, Management Report, etc. 10. Who can register on UDIN Portal? 11.Who has to generate UDIN? 12. 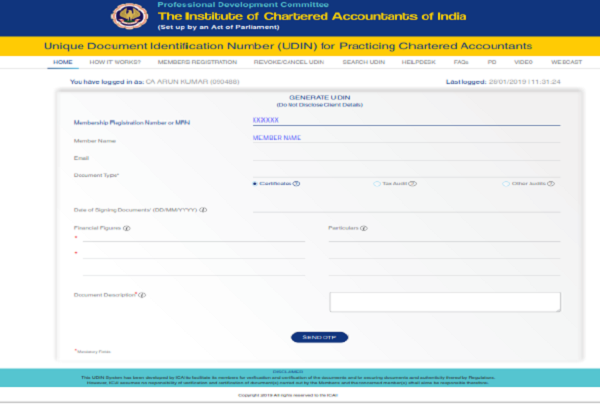 Is any person other than CA is allowed to register at UDIN portal? 13. Is UDIN required for Certified True Copies also? No, UDIN is not required for certified true copies. 14. Can a Partner generate UDIN for the Certificate signed by another Partner? No, only signing Partner has to generate UDIN. 15.Whether a Firm can register on UDIN Portal? 16. Who will generate UDIN for the assignment carried out by CA firm? 17. Whether UDIN will be applicable only for manually signed documents or also for digitally signed certificates being uploaded online such as Form 15 CB? 18. 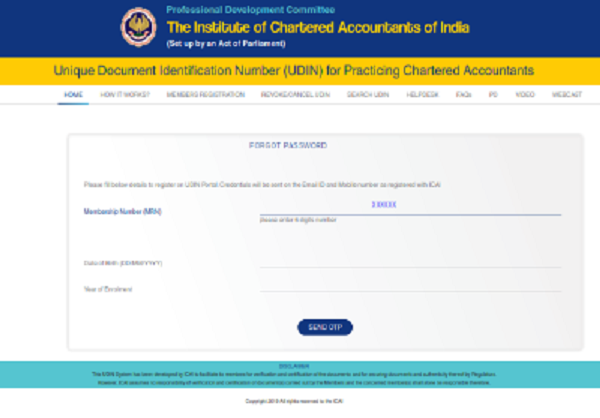 Is UDIN required for original Certificate only or for duplicates also? 19. 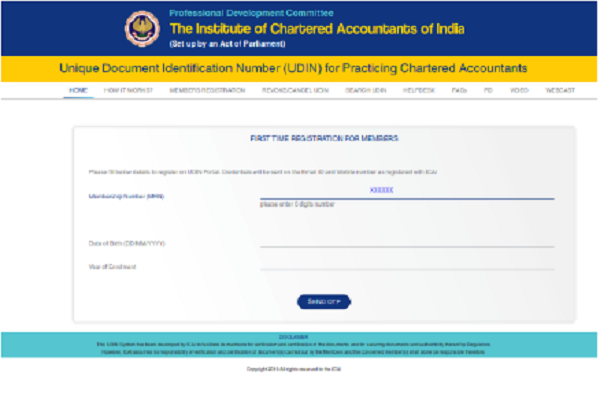 Is UDIN to be generated for the assignments awarded before 1st February, 2019 as UDIN for certificates being made mandatory wef 1st February, 2019? 20. Is UDIN applicable / useful for Members in Industry? 21. Can Part Time CoP holder generate UDIN? No. Since part-time COP holders cannot certify the documents. Hence, they have no access to UDIN portal. 22.Whether UDIN is mandatory for each certification done? 23. How to Register on UDIN Portal? 24. Does a member have to register on UDIN Portal for generating UDIN? 25. How to generate a Unique Document Identification Number (UDIN)? 26. Is it advisable to change the password after first login? 27. How to change the Password? 4. Enter new password, then click send OTP. An OTP will be sent on registered mobile and email. 28. What to do in case I forget the password? On confirmation OTP as received, a Username and password will be sent to the registered email and Mobile No. 29. What is required to generate UDIN? 30. What is meant by “Date of signing Document”? 31. What is meant by “Document Description”? 32. What are the Financial Figures and Particulars required to be mentioned for generating UDIN? 33. How UDIN can be edited? 34. What if the wrong UDIN is generated or if a UDIN needs to be revoked? If yes, is there any time limit for revocation the certificates? 35. How UDIN generated earlier by me can be tracked? Can it be sorted assignment-wise for our records? 36. How to Revoke UDIN? 37. What happens if the information is not accepted or the password is not sent? 38. How to Change/update /verify the mobile no. 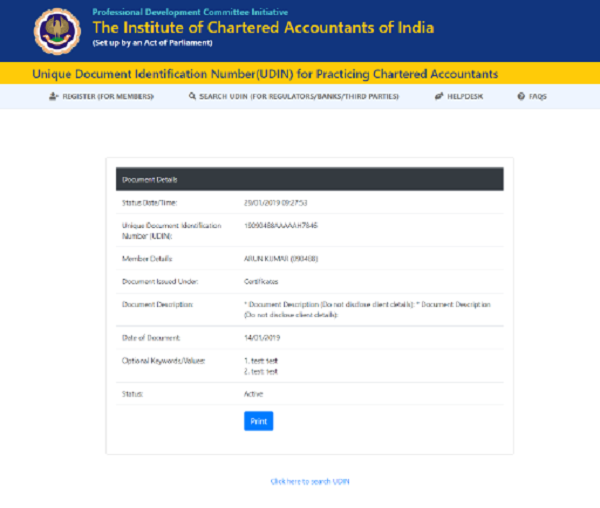 or email id in ICAI database. It can be done by contacting to the concerned Regional Office of ICAI to change / update/ verify the email and mobile number. 39. Sometimes there are multiple reports in one Assignment. Is separate UDIN is to be generated for all such reports? 40. How many UDINs can be generated by a CA? Is there any limit? Or is there any restriction on the number of UDIN to be generated in a Day/ Month/ Year? 41. Is UDIN required to be mentioned on every page of the Document or it can be mentioned at the last? 42. Whether fresh registration is required for every financial year? 43. Whether one UDIN can be used for multiple certificates generated on same day? 44. Can multiple certificate details be uploaded on UDIN portal in excel or any other format? 45. Should existing digital signature be revised or changed due to UDIN insertion? 46. Is it possible to generate UDIN before issuing the certificate? 47. What is the validity of UDIN generated? 48. What is the consequence of not generating UDIN which are made mandatory by ICAI in respective phases? UDIN generation is being made mandatory as per the Council Decision hence not generating UDIN for mandatory documents will amount to non-adherence of the Council Decision and may attract disciplinary proceedings as per the Second Schedule Part II of The Chartered Accountants Act, 1949. 49. How do Authorities/Regulators/Banks/Others can verify UDIN? The UDIN so indicated on certificate can be verified through the verify option on UDIN Portal by sharing few details such as Name of the Authority, Mobile Number and Email of the person searching the UDIN. However they are not required to register themselves on the UDIN Portal. 50. For verify UDIN, whether a regulator/third party requires to register on UDIN portal. No Registration is required for regulator/third party to verify the certificate. For verifying the UDIN regulator/third party has to mention UDIN number, Mobile number, email ID and Name of the authorities searching UDIN. 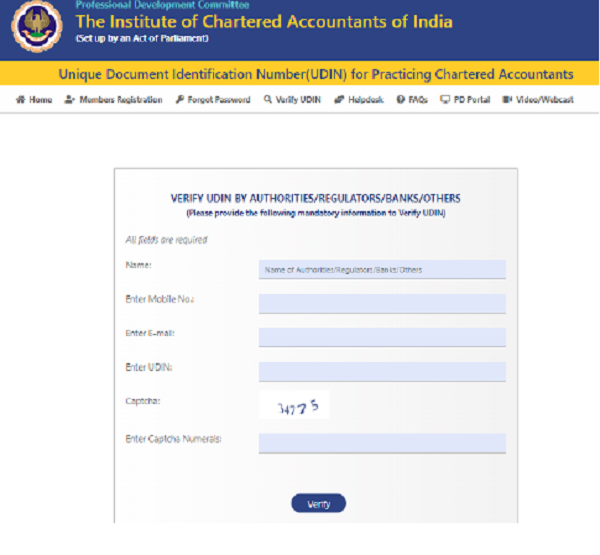 Members can submit their query online on the help desk tab on Menu bar available at https://udin.icai.org/complaints or can email at udin@icai.in. what is meant by ‘others’ (no.36).